The art of bronze produced in Morocco, in the first half of the twelfth century, remarkable works, reveal the birth of the Hispano-Moorish bronzerie. 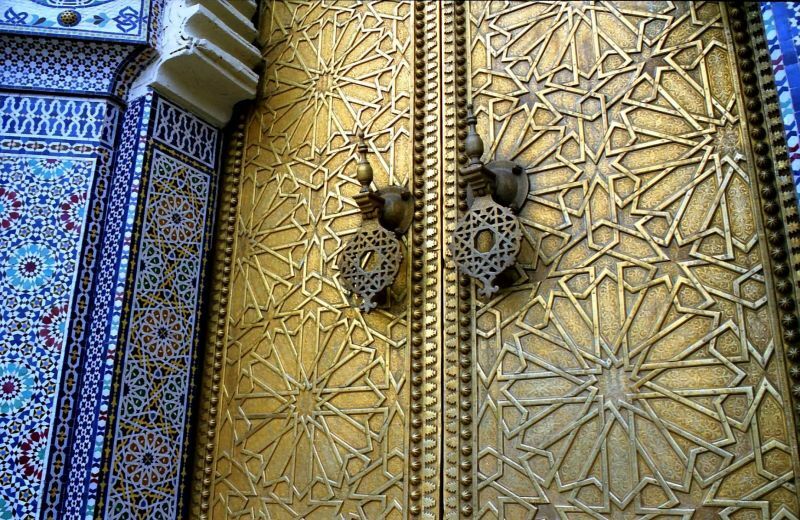 The famous bronze-lined almoravid gates of the Al-Qaraouiyin Grand Mosque -Bâb Sbitriyn, Bâb Ganaîz and Bâb Al-Ward- are considered to be the oldest monumental bronze bronzes of the Muslim West. They were made during the Almoravid enlargement of the sanctuary, between 528 (Hegira) / 1134 (AD) and 538 (Hegira) / 1144 (AD). The Batha Museum in Fes boasts some specimens deposited successively in 1954, and in 1958. (Cambazard-Amahan, 1989, 73-95). The structure of these works reveals, on the inner face a frame made of a framework of planks and projecting crosspieces, studded that consolidate hinges with five branches in wrought iron with floral endings. The outer surface is covered with molded and carved bronze plates, with the joints covered with a barley grain molded baguette. It is subdivided into transverse ornamental registers corresponding to the frame: the decoration is thus determined by the structure. 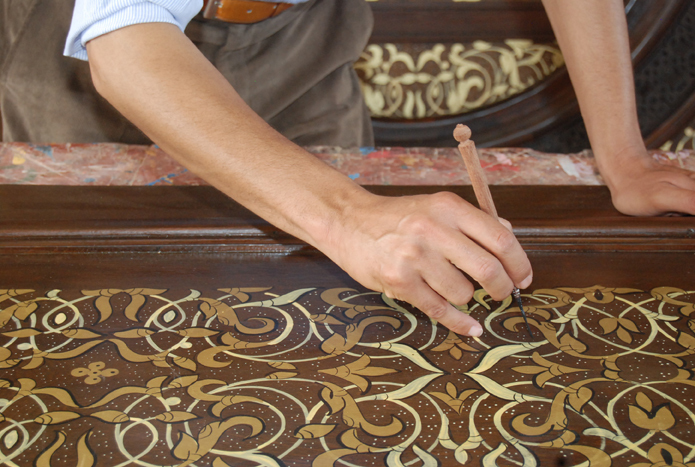 Each register, delimited by nails with gadrooned head, implements a specific ornamentation. At these gates prevails a decorative party imposed by the work of bronze: the search for the effect by contrast between the smooth plates, punctuated with nails in rosettes, and those decorated, as in Bab Sbitriyn. The flora composes most of the decoration of the leaves. It intervenes in filling bottom games, adapting to the geometry of the plates which imposed the layout; the ornament remains subordinate to the general scheme. To these leaves, the bronziers used a particular flora, adapted to the necessities and the effects of the ornamental techniques of the bronze: molding and chiselling. This flora, entirely smooth, distinct from that sculpted at the same time on other materials (wood, plaster …) (Amahan, 1989, 37-95), reveals a different school. The bronze plates deliver, more rarely an epigraphic decoration. Votive formulas of lasting happiness in angular kufic characters, sometimes woven, are inscribed with foliage belonging to the same plane. This sober, slender, balanced writing with a great clarity of movement characterizes the Almoravid script.